In the middle is Katy Kung, who attended the ceremony as a groomsmaid. She starred as Jason’s sister in Be Home for Dinner, a modern sitcom series. She’s also a good friend with the bride. The groom was born in London, so I presume they held the wedding near the city for that reason. 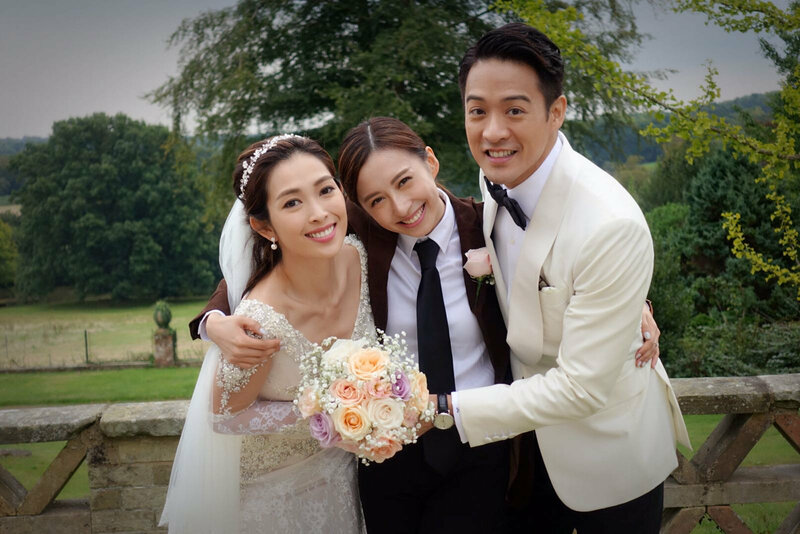 Most celebrities hold multiple ceremonies and banquets for their marriage these days, bet they will have celebrations in Hong Kong too. Congratulations and have a happy life. HD pre-wedding photos of Chinese celebrity couple Huang Xiaoming and Angelababy, taken in Paris obviously. The couple tied the knots in Shanghai yesterday in what many dubbed as wedding of the decade in China. Reports suggested that their wedding cost about US$31 million. Well, as long as they can afford it. Have a happy marriage and enjoy life as husband and wife. 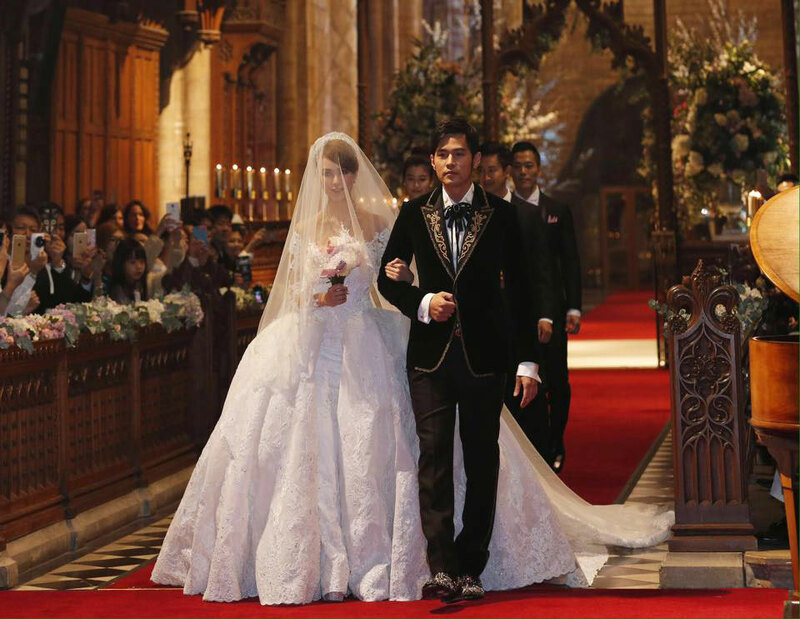 Taiwanese pop star Jay Chou tied the knot with his 21-year-old girlfriend Hannah Quinlivan at the Selby Abbey in North Yorkshire, England, on January 17, the eve of his 36th birthday (it’s already Jan 18 in Taiwan at the time of wedding). Taiwanese pop group S.H.E member Ella Chen has tied the knot with her Malaysian hubby Alvin Lai. The couple held their wedding ceremony on May 5 in Taipei. Congratulations. Image via Sohu [Cn]. Popular Korean actor Ko Soo got married on February 17. Plenty of celebrity guests, including Lee Byung-hun (who emcee’d the event), Han Chae-young, Jo Hyun-jae, Jung Suk-won, Han Hyo-joo, Jung Woo-sung, Ji Sung, Gummy, Bae Soo-bin & Park Jung-ah etc. The groom decided to keep his non-celeb bride in private though. Bhutan’s King Jigme Khesar Namgyel Wangchuk, 31, has married his commoner bride in an elaborate Buddhist ceremony on October 13th. The newly crowned queen is 21-year-old student Jetsun Pema. It’s widely reported in Chinese media that the royal couple has known each other for years.